On 7 May 2015 Mr. Mircea Ciopraga, Secretary General of the PS IGC TRACECA visited Kutaisi International Airport in Georgia. During his visit Mr. Ciopraga met with Mr. Eduard Mnatskanyan, Operations Manager and Mr. Zaza Gabadadze, Manager of Kutaisi facility, Georgian Air Navigation. Mr. Ciopraga made survey to the airport’s infrastructure and facilities. 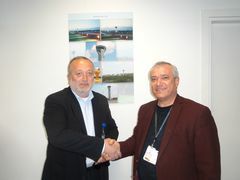 Representatives of the Kutaisi airport informed Mr. Ciopraga about the latest developments and success up to now. It should be noted that Kutaisi David the Builder International Airport was opened in September, 2012 and has over 260 000 passengers in year. Kutaisi Airport is focused to attract low cost carriers and facilitate tourism development in the country.